When it gets as cold as it is now here, I need to dream of the sun. Or of sunny food. This recipe is for those of you who still have summer somewhere, probably very far from here. It’s a vibrant dish, with all the colors and flavors of the Mediterranean. To get it right, you do need good sun-ripened eggplants and plenty fresh basil. No greenhouse ghosts of ingredients please. Pasta incasciata is traditionally prepared in Sicily for the August 15th holiday. The term means “baked in a mold” or “baked with cheese”, in other words a timbale. Timbales have been popular in Southern Italian cuisine as early as the XVII century and they still are. I love the sensual description of a pasta timbale given by Tomasi di Lampedusa. In its legendary novel The Leopard, he describes a dish presented at the table of Fabrizio, prince of Salina in XIX century Western Sicily. The pasta incasciata is the peasant version of the princely timbale. Meat, spices and truffles are substituted by (less expensive) eggplants, eggs, cheese and some sausage. May be simplified, but to me it’s a royal treat. My family’s version of the recipe is slightly lighter than the original. If you wish to follow the tradition, use Italian salami instead of ham and pecorino instead of Parmesan. Using the recipe in the link above, make a basic tomato sauce with two 400 gr./12 ounces can diced tomatoes. Cook pasta in large pot of boiling salted water for half of the time indicated on the package. 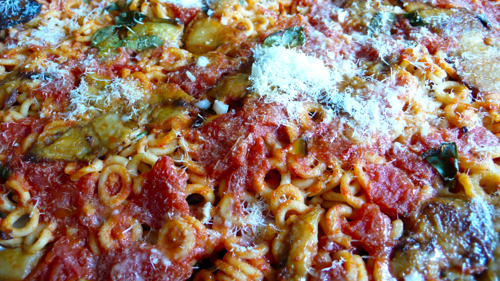 Drain well and toss with 3/4 of the tomato sauce and half of the Parmesan. Build up the timbale in layers starting with a ladleful of sauce on the bottom of a ovenproof pan. Top a layer of pasta with cheese, ham, egg slices, eggplant and a few basil leaves. Sprinkle lightly with Parmesan. You should be able to make 3-4 layers depending on the size of the pan. End with a layer of pasta. Drizzle 3-4 tablespoon of the reserved tomato sauce, add a few basil leaves and a final sprinkle of Parmesan. Bake until cheese melts and timbale sets, 20 to 25 minutes. Serves 12. Yum, Letizia, that looks so good — especially on a cold winter day. Eggplant, basil, tomato sauce, pasta, cheese……how could it fail? This recipe looks somewhat similar to what we made last June, with the large group? Although that was probably more likely a rice timbale, with rice (obviously!) and peas. That was also so good, but this looks a bit lighter and just as delicious. Speaking of di Lampedusa’s novel, I saw the movie version of The Leopard a few months ago and thought it was great (although I question Burt Lancaster playing the patriarch of the family!) Would you recommend the novel? Sandra ciao! I have seen this comment only today. Indeed the method in this recipe is similar to the sartù di riso we did at the last cooking class you attended here. I have read the Leopard long ago and I loved it, it’s a good novel to understand Sicily. oh my, I have never met anyone else that used eggs in their recipes like my mom’s family we even layer our lasagna with boiled egg I love this recipe thanks! Hi Claudia, thank you so much for visiting. Boiled eggs are vastly used in Southern Italian cuisine as a cheap substitute to meat. They are delicious. My mom used boiled eggs everywhere even though we could buy all the meat we wanted! oh god! i love this dish!!! Hi Kathy, thanks for visiting! Really nice blog and your B&B sound fantastic. Will check on staying at your place if I get back to Italy. Grazie tantissimo delle ricette. thank you, I hope you will get back to Italy soon! Couldn’t have put it better! Great metaphor. And a fantastic blog. The recipes, storytelling, and photography are all lovely. I look forward to new installments! Cheers. thank you, you also have a fabulous blog! My mother also made this (we’re from Messina) but she added meat to her sauce and provoloni cheese and used salami. It was so rich and filling!!! Thanks for the recipe!! My mum was also from Messina, she left in the early 60s to move to Perugia, in Umbria. Indeed you recipe is one of the variants of this magnificent dish, every mouthful is a taste of Sicily! I have been looking for a good recipe for Timbale – thank you! I am sure we will – thank you!